My original writeup (below) was written before I knew that the glorious lead vocals here were contributed by none other than Motown maven Brenda Holloway (and that there's also another Wooden Nickels 45 that is OK, but not on the level of this one). As Brenda was under contract to Motown at the time, her appearance here was uncredited. 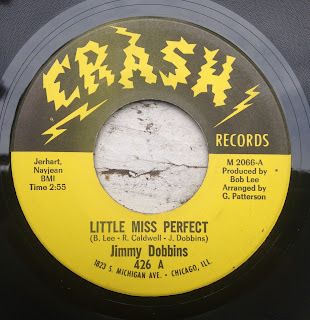 I've proclaimed this to be my favorite 45 of all time more than once. Here is perhaps one of the ultimate one-off records. Other than being a staple of collectors' want lists around the world for many years, no one seems to know ANYTHING about this group. 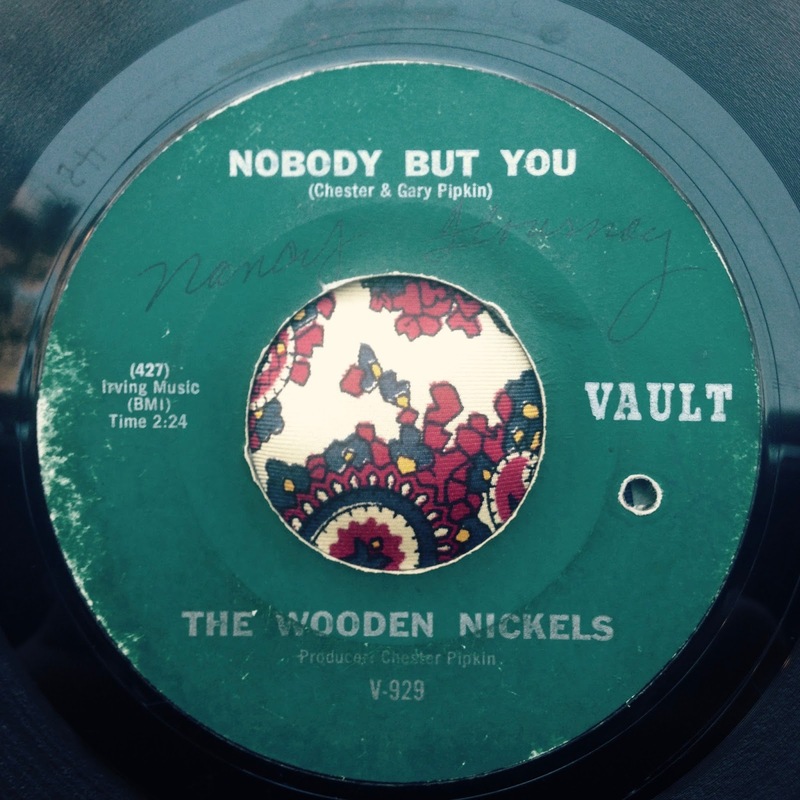 Vault records was located in Los Angeles, so it's safe to say this is an L.A area record. 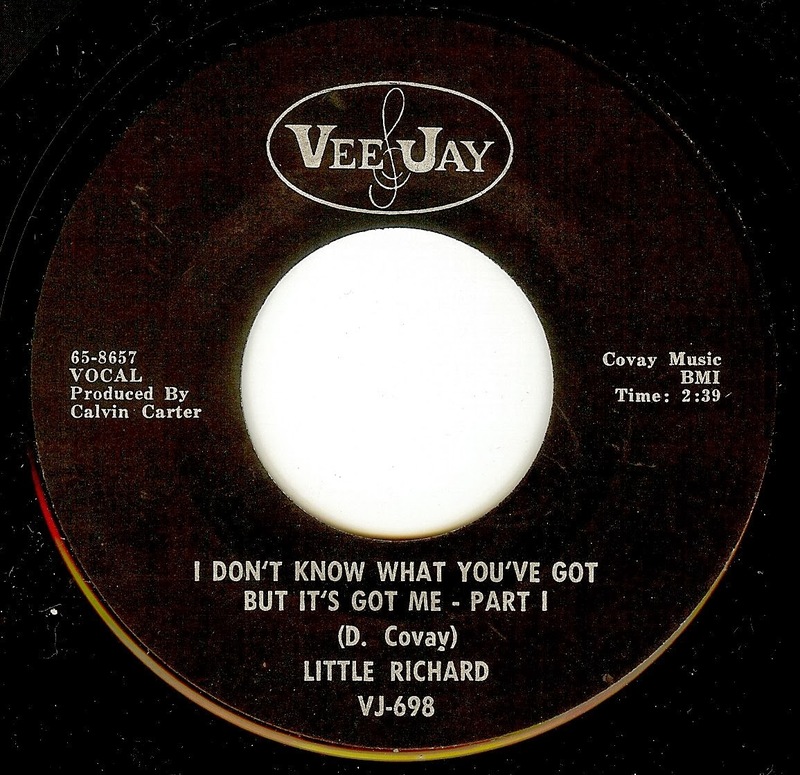 The song was written by Chester & Gary Pipkin who started out in doo wop groups and ended up becoming versatile composers throughout the 60's and beyond. 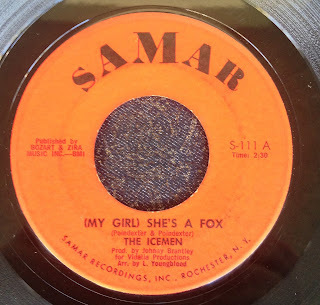 One thing that is certain is that this is one of the hottest 45's of the 60's; the band is cookin, and the female lead/ male backing vocals are uplifting to put it mildly. The low-fi recording only adds to the excitement (part of this may be some groove damage to my copy but with a record like this, no big deal. This is a record that I just wanna hear over and over again, LOUD. My love for the work of Jimi Hendrix is unparalleled; his innovative and ground breaking guitar work set the standard, but it was his songwriting, performing, and charm that extended his appeal beyond musicians. Hendrix was oozing music, and it was evidenced by these early sides, cut before his "discovery", move to London and imminent fame. 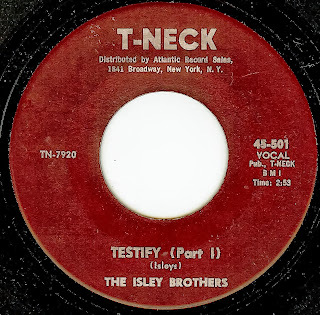 The Isley Brothers infectiously intense "Testify" was Jimi Hendrix first released recording session, and with his first guitar solo that was unleashed to the world, the man shows that he meant BUSINESS. He plays his break with a focused intensity that, no matter how many times I've heard it, still snaps my neck in to place in a way that no chiropractor ever could. After his release from the Army/ 101st Airborn in 1962, Seattle born Hendrix settled in Nashville, playing music with his army buddy Billy Cox. By early '64, Hendrix left for New York City, and began struggling to make a name for himself in the big apple. 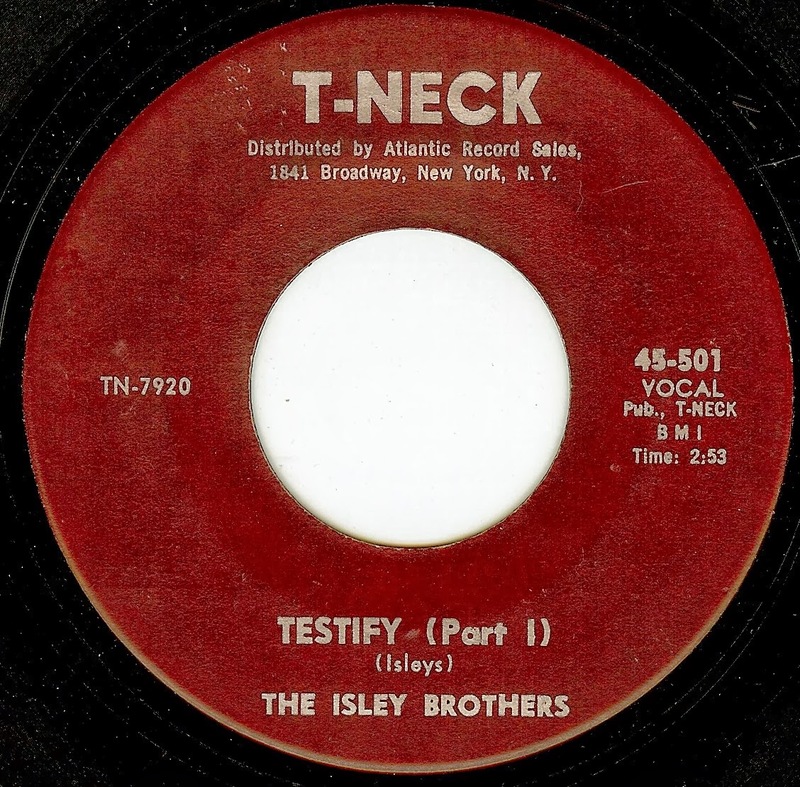 All the while, The Isley Brothers pay tribute to the great soul stars of the day and whip up a fury akin to the most outrageous fire and brimstone revival. Around the same time, Hendrix also played on the session for Don Covay's "Mercy Mercy"; while that's a fine record in its own right, I'm not featuring it here due to it being one of the easier tracks to find. It's best heard on the excellent Hendrix box set West Coast Seattle Boy. These sides have been reissued in different mixes/ edits, but here's part one and two as they were originally released in 1964. 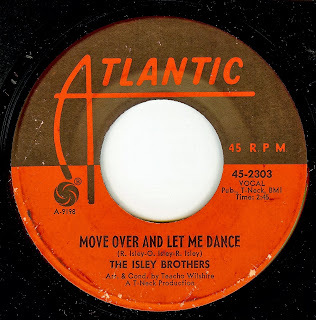 In lesser hands than The Isley Brothers (with young Jimi Hendrix on guitar, no less), this track could have been a very pedestrian number that was downright forgettable. The song itself isn't much of anything, but in a way it's the precursor of James Brown's funk revolution that was brought on my the following year's "Papa's Got A Brand New Bag"; a rhythmic musical jam with lyrics that are more shouted/ chanted than sang. And other than JB himself, there was simply no one better at shouts than The Isleys, as they had been showing off since "Shout" back in 1959. Plus, Hendrix plays some incredible, DRIVING guitar throughout; the definition of soulful, loose and fluid. This record has been a holy grail of sorts for me since, oh, around 1990 when I first read about it in the book Jimi Hendrix: Electric Gypsy. In those days, of course, there was no internet so the possibilities of being able to hear this incredibly scarce record were close to impossible! Luckily, some time in the mid '90's I finally got to hear it, on a 5th or so generation cassette copy with tape hiss as loud as the music! Both sides lived up to and in fact, surpassed my expectations. It's a great record. 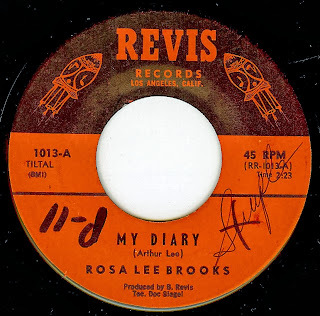 There are conflicting stories about authorship of "My Diary" (Arthur Lee is credited on the record, while Rosa Lee insists that she and Hendrix wrote the song) and also the year of recording (Rosa Lee claims 1964). The most likely story is that, in early 1965, young "Jimmy" Hendrix was on tour with Little Richardand The Upsetters when he decided to go AWOL in Los Angeles. Hendrix is said to have met Rosa Lee Brooks while they were both in the crowd at an Ike and Tina Turner show, and that night marked the beginning of a fleeting romance that lasted until Jimmy headed back to New York City. 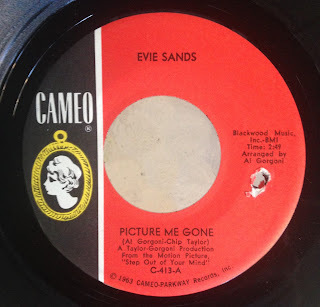 Rosa Lee knew Billy Revis, head of a small studio/ record label, who she and Hendrix persuaded to cut the single. Legend has it that when Rosa Lee picked up Arthur Lee to go to the recording session, Hendrix immediately became jealous and the situation became tense (the two reconnected a few years later without rivalry). Arthur's backing vocal is clearly heard on the record, and Hendrix lays down some of the greatest guitar work of his entire life on this track. The flip side, "Utee" was written in the studio and features a red hot Hendrix break. The record was announced in the Billboard Magazine in June of 1965, but other than a few rumblings in L.A, never went anywhere. Within a few months, Arthur Lee formed the group that, by the fall of 1965, became Love. Hendrix struggled along in New York for another year and some months until fate brought him into the lap of Animals bassist Chas Chandler, who took him to London and helped make him a star. Rosa Lee Brooks has kept on singing, but this seems to be her only release. And what a release it is! (note: both sides were issued on the excellent Hendrix box set West Coast Seattle Boy a few years back, but it doesn't diminish the thrill of owning and sharing the actual 45 one bit). For nearly five years (late '57 until 1962) Little Richard had left the sinners life of secular music, and became a preacher. It wasn't until an offer to tour England in '62 came on the table that Richard made a return to his signature secular sounds. Before being "discovered" by Chas Chandler and the formation of the Experience in England and the massive success that followed, Jimi Hendrix lived in abject poverty and took whatever gigs and sessions he could. Stints with The Isley Brothers and Little Richard which resulted in sessions and tours were perhaps the most high profile, yet there was a string of other fabulous soul singles cut that took full advantage of the man's wizardry of the guitar. This is one of the most obscure singles which feature Jimi, and what he does during the intro is 100% pure Hendrix. 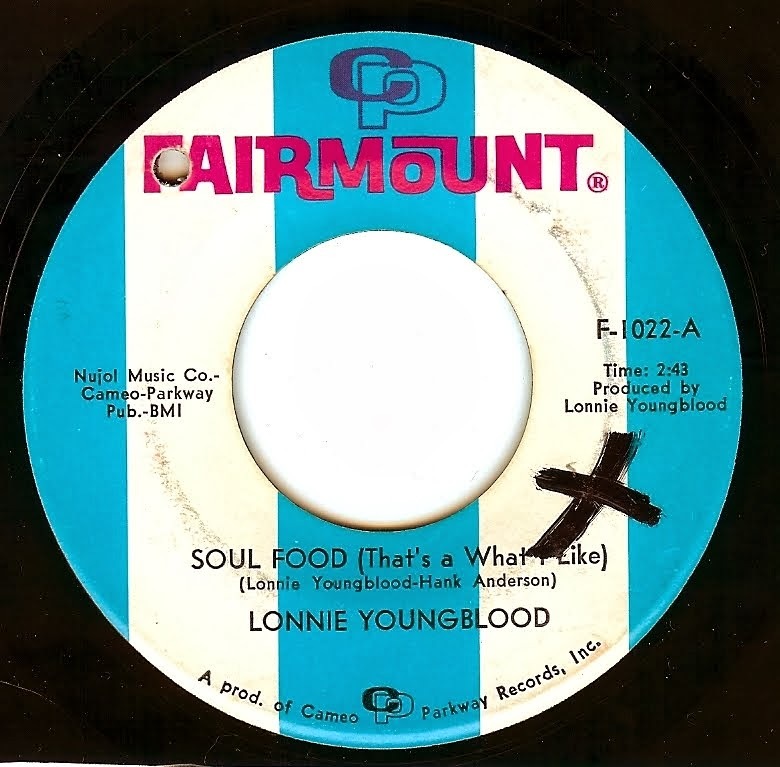 The recent West Coast Seattle Boy box set collects this and other gems (including the impossible to find Rosa Lee Brooks "My Diary" single, which is not only Jimi's first session but also featured a pre-Love Arthur Lee), however the version of this song used on the set is a completely different take! 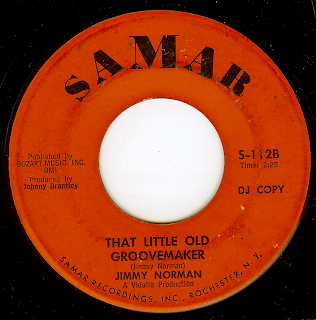 Jimmy Norman found the most success of his career in writing the lyrics to the eternal "Time Is On My Side", and released a handful of singles on his own. The Icemen were another group (or studio concoction) that used The Impressions as their guiding light; as Jimi could play those Curtis Mayfield licks as well as anyone other than Curtis himself, it only made sense that he played on these tracks. This is the most recent record I've added to this particular collection of Hendrix sessions, and it's a tricky one to find (I'm still after the Frank Howard and Lenny Howard singles - if you wanna sell me copies of these, please lemme know!). Basically taking "Like A Rolling Stone" and changing the lyrics to reflect civil rights protest, this would be a great record in it's own right. However, even more interesting is the small credit on the label; "arranged by Jimmy Hendrix". Yep, Hendrix himself before fame, and before swapping the extra "m" and "y" in his name to become Jimi. Hendrix lays out some killer fuzz tone and plays some of the other great licks that he played on his own famous version of "Like A Rolling Stone" recorded a year and a half later at the Monterey Pop Festival. Curtis Knight was the bandleader that Hendrix worked with quite a bit, and there are many recordings of him with Jimi which would be too complex for me to get into in this entry. I love Curtis' powerful lyrics and delivery on this track. Sadly, the contract that begat this record also became a thorn in Hendrix side; he was still legally bound to producer Ed Chalpin (manager Chas Chandler bought up all of Hendrix previous contracts except this one, which slipped thru the cracks), causing great stress and legal litigation in Jimi's life, the end result of which was Hendrix having to hand over the Band Of Gypsys album to Chalpin for release on capitol records. This was after two shoddy albums were also released by Chalpin of the Knight/ Hendrix recordings to cash in on Jimi's name. 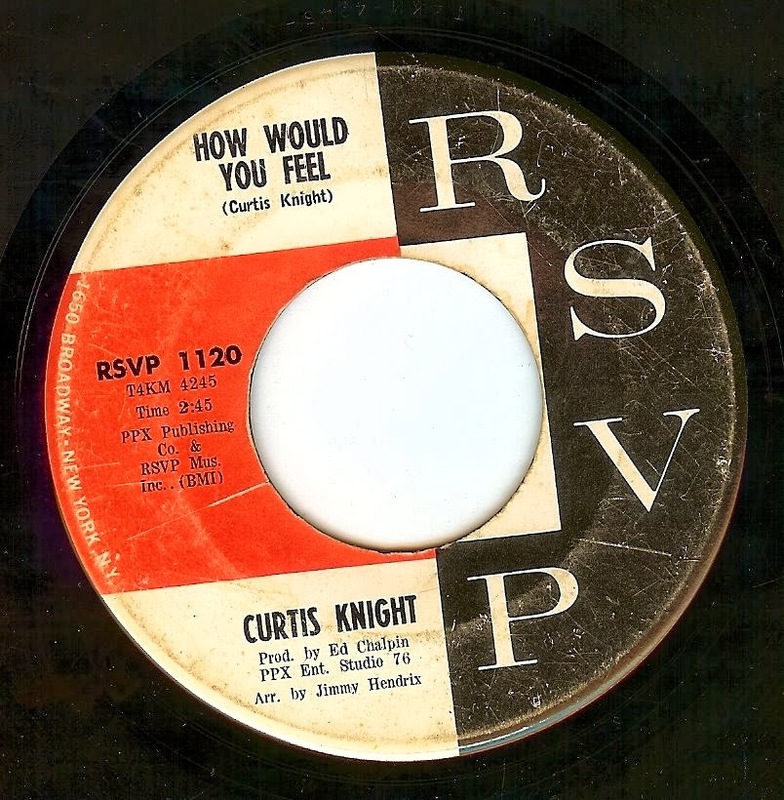 CURTIS KNIGHT - HOW WOULD YOU FEEL? Ft Worth, Texas native Ray Sharpe took influences from rock n roll, country and r&b music and created music that was entirely unique. 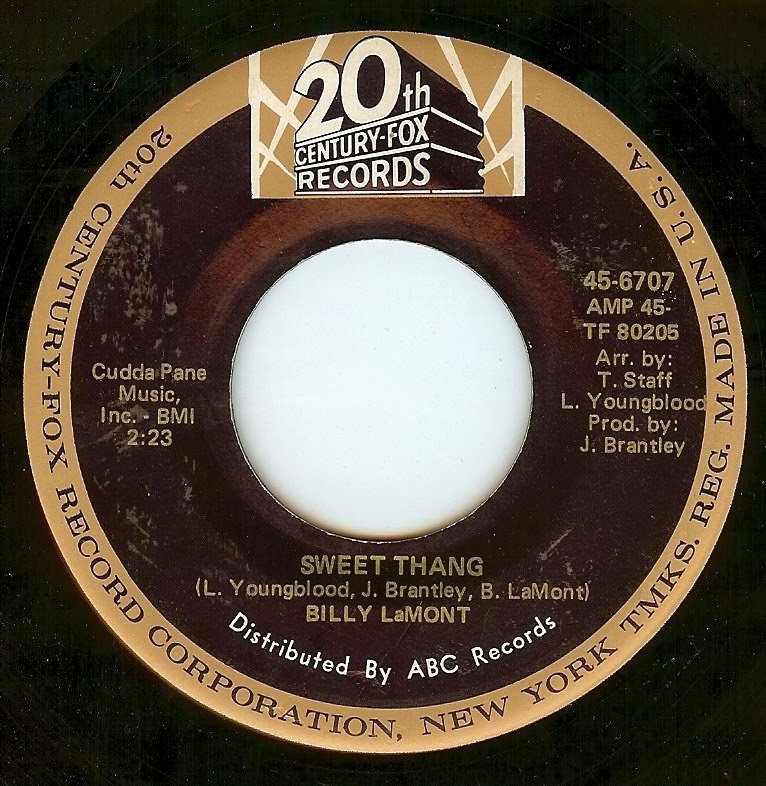 While his early singles (including the big hit "Linda Lu") could be classified as rockabilly, these records also could fall into the r&b classification. What's in a label anyhow? By the time of this release, Ray was working in New York City with the legendary King Curtis. Producer/ sax man King Curtis must have truly loved this track, as he used it FOUR times, this being the first appearance. In early '67, Ray Sharpe's vocal was removed, the track was sped up and new lyrics were added and it became Aretha Franklin's incredible "Save Me. Also in '67, the same backing track was used for Owen Gray's version of this same song, and was released in the UK. 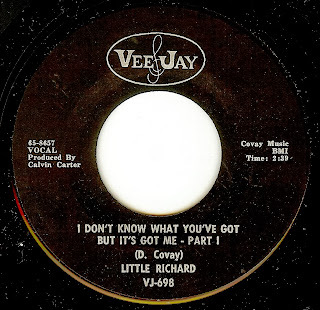 Finally, in '68 King Curtis reworked the same basic track and turned it into "Instant Groove". It's no surprise that Curtis loved the track, as it's a smoker- taking its cue from Them's "Gloria", the track is a masterpiece is smoldering dynamics. 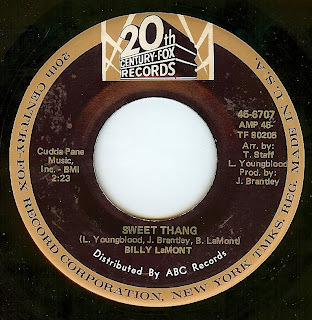 While the track starts off in full flight, through some subtle nuances the musicians keep turning up the heat until its a smoldering inferno of go-go goodness. None other than Jimi Hendrix is on guitar, as well. Hendrix is really given a chance to play on Part 2, although he plays a very subtle (yet still effective) break. A super cool double sider, made even more exciting by the presence of none other than Jimi Hendrix blazing on guitar during one of his earliest sessions. 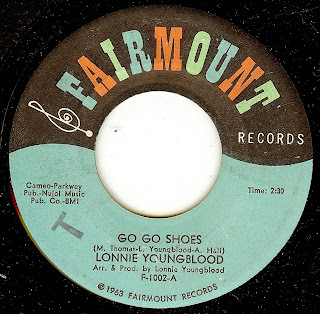 Just like Hendrix, vocal and sax man Youngblood was transplanted into the bustling New York City music scene (he was born in Augusta, Georgia) and odds are the two met while playing with Curtis Knight & The Squires. Lonnie & Jimi obviously had a great chemistry that was demonstrated on this record (as well as on their other single together, "Go Go Shoes") and while Jimi only gets scant opportunities to cut loose, it's clear from Jimi's breaks on "Bessie Mae" that all the pieces were in place for Hendrix to turn the music world upside down only mere months after this record was cut. Ooh dig that guitar on the opening...Who else could it be... None other than Jimi Hendrix! This track was recorded in New York City shortly before Jimi left for England and became a superstar. Not much of a song here, per se, but it's a really hot slice of simmering early funk and Jimi's incredible guitar and the pounding drums make this one hot record. 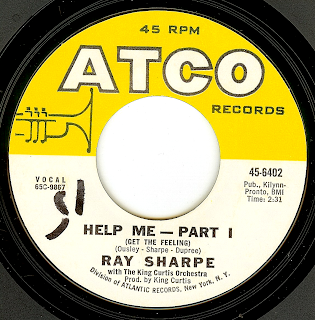 As mentioned above, the same backing track for Ray Sharpe's 'Help Me' was recycled several times. This is an excellent version of the track, featuring Jamaican born Owen Gray delivering a fiery vocal. It's an obscure one, as it was released only in the UK. This one's only gonna be up for a short time, so grab it while you can. 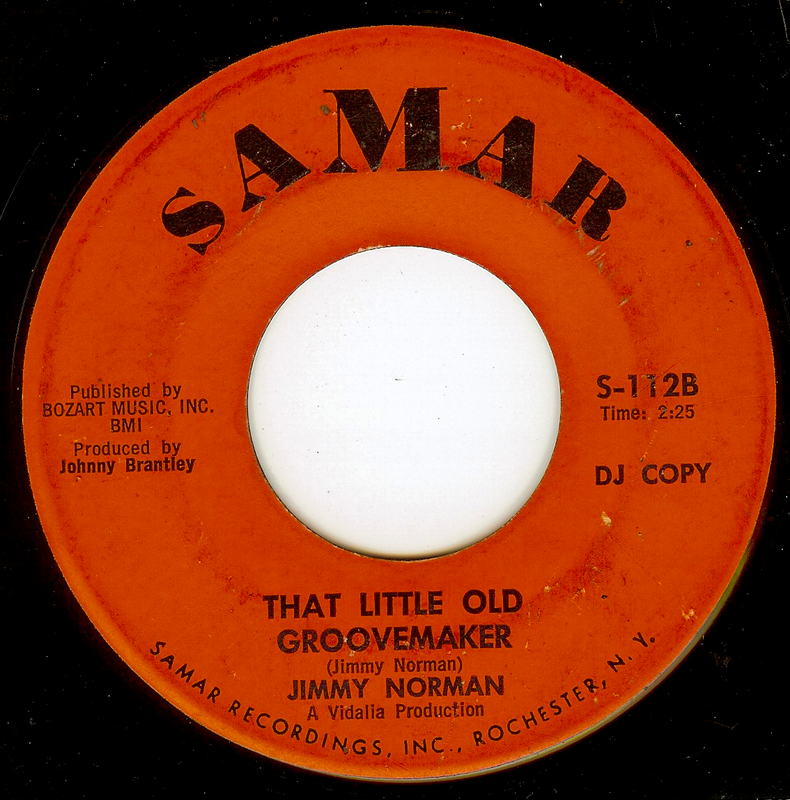 This single, released in April 1970, was the last thing Jimi released while he was still on earth, and it was withdrawn shortly after its release. Some say that Jimi was unhappy with the mix, but the real reason may never be known. What *is* known is that the 45 mix of 'Stepping Stone' is ONLY heard on the original 45; the version used on the posthumous Kiss The Sky LP is very close, but on close listening there are some subtle differences in the wall of guitars weaving in and out of the track. Both sides of this record are devastating; 'Stepping Stone' is one of Jimi's greatest guitar symphonies, and the song clearly shows the frustrations that he was feeling in his life and music at the time. Buddy Miles' intense drumming makes this song feel like an out of control freight train until the final explosion at the end and the engineer's statement of 'you made it'. 'Izabella' is one of the blueprints of funk-rock, with an unstoppable groove and a lyric full of powerful metaphors. Jimi's brilliant songwriting was right on par with his spellbinding guitar work. The man *was* music. Jimi was the greatest, and my biggest influence as a musician. Here's one that's never been previously featured here. A scarce record, took me quite a while to score a copy. While Sharon Tandy is best known for the immortal freakbeat classic 'Hold On' (a devastating record), she cut several more excellent sides, many of which were backed by the legendary Les Fleur De Lys (who back her up again on this monster). Starting out with a funky, solo wah wah'ed guitar, the band and Sharon kick in with a HEAVY groove and OWN the next 2:15 with a massive performance. 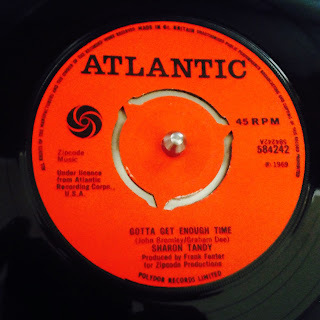 Sharon Tandy has an interesting story as well. Born in South Africa, Sharon appeared in a South African beat film while still a teen, and then relocated to the UK at the insistence of her management. Sharon met with moderate success, and was lucky enough to record at Stax studios in Memphis in 1966. Phew, is THIS one red hot mystery record! It's a Chicago release, and I'm gonna guess it was released around 1965. Haven't been able to find any info about the artist at all (other than he cut a few more sides, but in the mid-'70's). Just when you think they cant possibly cook any more, they throw in the whoa whoa whoas and we're left picking up a roomful of rubble from the devastation. "This Is my GrandFather his stage name was Jimmy Dobbins but everyone knew him as Jimmy Brown, He is Deceased now, he died in 1995 My name is Devin Brown and i inherited his amazing vocals"
But after he Graduated from High he moved to Gary Indiana, which is where he met my Grandmother, and they moved to Chicago thus, My uncle, Jimmy Brown Jr. was born,1967, then My Mother, Jaconna Brown was Born in 1969.Most of the love songs he made were dedicated to my grandmother"
Happy birthday Neil! Such an inspiration to so many of us. Whether he's pulling at our heart strings with a gorgeous acoustic ballad, blowing the roof off with Crazy Horse, gettin' freaky with a vocoder, or kicking out a freakbeat side such as this, Neil RULES. On it's own, 'Mr Soul' is one of THE classic '60's rock n roll tracks; of course it was heavily influenced by 'Satisfaction', but Neil and the Springfield take it someplace entirely different; the alienation of stardom, which is a world that Neil has revisited several times in his career. Dewey Martin clearly shows off his soul fanaticism with a drum performance that's straight outta Stax, Bruce Palmer freaks out on bass, and the three guitarist/ vocalist, driven by talent and ego, turn in a performance for the ages. Even cooler is that the 45 features an alternate guitar solo that is less 'to the gut' and more tripped out psychedelia. Evie Sands has had a fascinating career in which there were far too many near misses, mostly due to competing versions of the same songs by other artists released at the same time. However, her records have grown legendary throughout the years, and for good reason! Evie is still out there performing; she was a true pioneer in that she's not only an incredible vocalist but also a highly skilled guitarist. Transcendent is the only way to describe this one. A masterpiece in production (reminds me of what a Brian Wilson/ Phil Spector/ Motown collaboration would sound like), this song is infectious and jaw dropping. Quite possibly the best fake out ending on record, too. Alright! Sorry for the gap in posts... Back with a red hot side that has never been previously featured here. 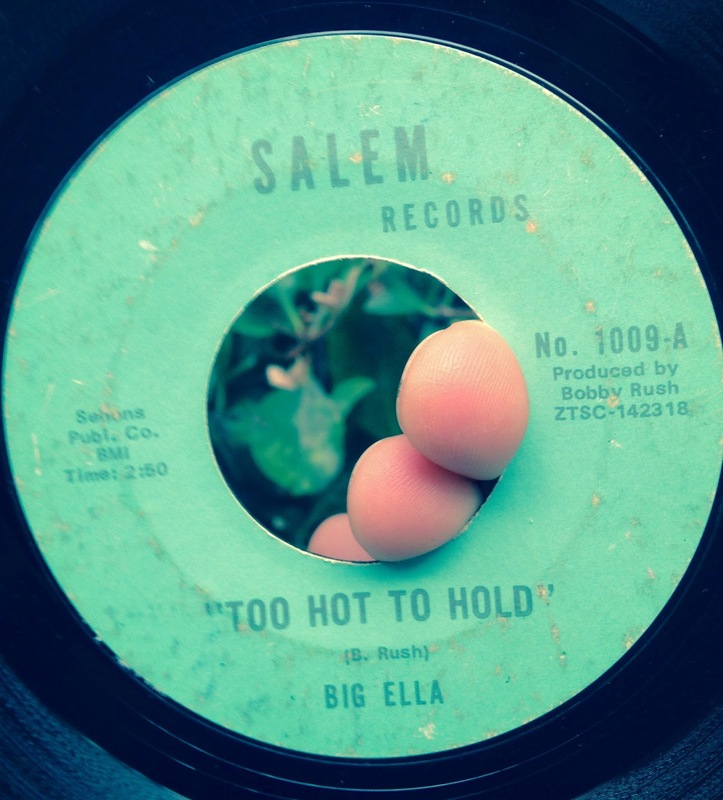 Big Ella (Ervaerlla Tate) is a bit of a mystery figure; she cut 3 singles in the late 60's and qwuickly disappeared from the world of recorded music. Being as Bobby Rush is listed as writer and producer, it's safe to say that this is a Chicago joint. The best story though is in the grooves; 'Too Hot To Hold' is a scorching, intense slab of sister funk with an incredible vocal and a band that can easily give the JB's a good bit of competition.